A Tucson police officer accused of committing sexual misconduct with a woman he was investigating was arrested Sunday evening. The Tucson Police Department’s Office of Professional Standards Unit was told on Thursday that Officer Richard Daniel committed “unlawful sexual conduct” with the woman on Jan. 13. Daniel, a three-year veteran with the department, was arrested after detectives were able to establish probable cause, police say. Pete Dugan, a spokesman with the Tucson Police Department, said Daniel was booked into Pima County Jail with one count of unlawful sexual conduct as a peace officer and one count of tampering with physical evidence with additional charges pending as the investigation continues. Dugan said Daniel has been placed on administrative leave without pay and was served a notice that he would be terminated. Police didn’t elaborate on the investigation Daniel was conducting when the incident allegedly occurred. Dugan said the allegations against Daniel don’t reflect the rest of the department. The evaluation in Mesa, Arizona, includes a possible civil rights violation by police for punching a man after he refused to sit down. Editor’s Note (Aug. 30, 2018, 6 p.m.): The name of a 15-year-old who was arrested on suspicion of armed robbery was removed from this article. It is the policy of NBC News not to identify minors who are charged with crimes. The FBI will investigate the use of force by police in two arrests in Mesa, Arizona, including one in which a man was punched by officers who were responding to a complaint about another man, for possible civil rights violations, police said Wednesday. The federal agency informed the Mesa Police Department on Tuesday about the review, which included the arrest of Robert Johnson, who was seen in surveillance video being punched by police in a May 23 encounter. The other case centers on the arrest of a 15-year-old boy who the Mesa Police Department said was arrested on suspicion of armed robbery on May 16. Body camera video appears to show an officer threaten to “f— you up” and place a foot near the back of his neck when the boy was on the ground and handcuffed. The development comes days after the Scottsdale Police Department, which was called in to conduct the initial investigation, determined that the use of force by officers in Johnson’s arrest was justified and recommended no criminal charges. Johnson, 35, was punched and arrested after police responded to a report of a domestic disturbance involving another man who had allegedly tried to force his way into an ex-girlfriend’s apartment. An officer wrote in a report that Johnson refused a request to sit down, and that the officer believed he was preparing for a fight. Charges against Johnson were later dismissed by a judge at the request of prosecutors. Johnson’s attorney, Benjamin Taylor, said in a statement Wednesday that he was pleased the FBI was looking into the use of force in the incident, which he called a case of police brutality. “We hope that the FBI will do a fair investigation and help clean up the Mesa Police Department’s culture of hurting citizens and give justice to Mr. Robert Johnson,” Taylor said in a statement. A Mesa police public information officer said in an email that an internal investigation into Johnson’s arrest is continuing, and the officers involved have been placed on administrative leave. 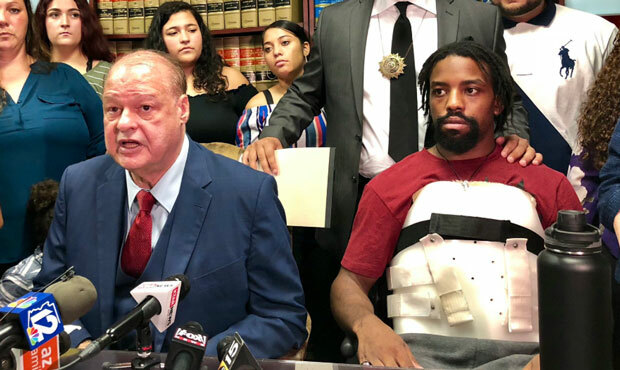 “Based on the totality of the circumstances and all of the evidence in this case, our final determination is that no criminal charges are warranted against the involved officers as the use of force was legally authorized and justified under Arizona State Law,” Scottsdale police said. They added that the case was presented to the Maricopa County Attorney’s Office, which agreed with the conclusion. Taylor said he intends to file a civil lawsuit. Prosecutors on Aug, 17 determined that no charges would be filed against the officers in the 15-year-old’s arrest, saying state law permits use of reasonable force to effect an arrest. The probe looked at possible aggravated assault because when a “mandibular,” or jawline, pressure point was used the suspect was in handcuffs, the Maricopa County Attorney’s Office said. The 15-year-old is being prosecuted as an adult, the Arizona Republic reported. The Maricopa County Attorney’s Office said it made no determination whether the force used in that arrest complied with department policies. 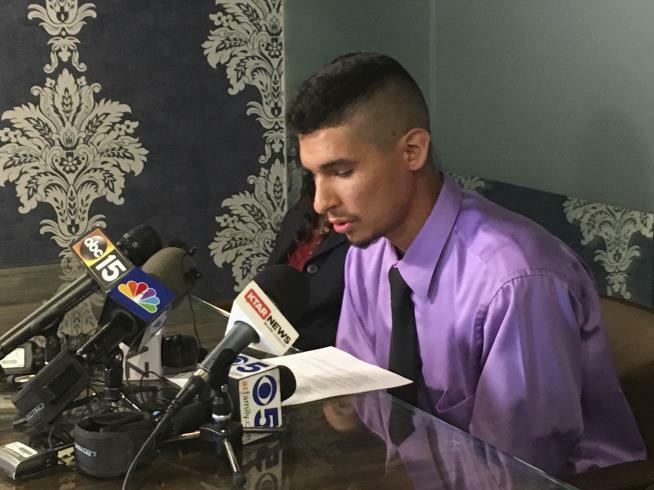 (Newser) – “This is no laughing matter.” So said a 23-year-old Arizona man at a Thursday presser in which he detailed his January arrest by the Mesa Police Department, the Arizona Republic reports. Per CNN, Jose Conde says on Jan. 28 he was searched, then hurled to the ground, “heaved into a wall,” stun-gunned, and “punched over and over by multiple cops. I was gouged in the eye and I was hit in the head with a massive police flashlight.” And then, “they laughed at me while I lay in a pool of my own blood barely conscious.” A police bodycam video has now emerged from the night Conde was arrested, after the car he was a passenger in was pulled over for not having its headlights on. Conde is seen stepping out of the car in the video, which is when the confrontation with the cops began. As Conde screams, an officer is seen punching him. In a later video taken at the hospital, an officer can be heard saying to a bloodied Conde, “Bless his little heart. Aww. Man up.” Conde’s videos come on the heels of two others involving Mesa officers apparently using force: one in the case of a 15-year-old boy, and one in the case of Robert Johnson, who was arrested in May. Charges against Johnson have since been dropped. In Conde’s case, the police report says he resisted arrest and threw swings at an officer who found cocaine in his sock. Police Chief Ramon Batista says his department is reviewing the case and has called for independent investigations, but that “simply put, the tape released … by media outlets does not tell the full story concerning this arrest.” Conde, who was charged with narcotics possession, escape, resisting arrest, and aggravated assault on police, goes on trial in July. The Mesa Police Department released surveillance video on June 6 that shows three officers beating an unarmed man in the hallway of an apartment building. Four police officers from a Phoenix suburb have been put on paid administrative leave after video showed them beating an unarmed man last month, the Mesa Police Department said. On Tuesday, the department released a 15-minute video of the incident, which took place May 23, in an effort to be transparent after recent high-profile cases where its officers’ use of force was questioned. The footage shows four men in uniform frisking a man in a gray shirt as he stands near a railing on the upper floor of an apartment complex, holding a phone to his ear. The officers appear to give direction to the man — later identified as 33-year-old Robert Johnson — at which point he walks toward a wall. Moments later, the officers have Johnson backed up into a corner near an elevator, then take him down. Johnson does not appear to resist. 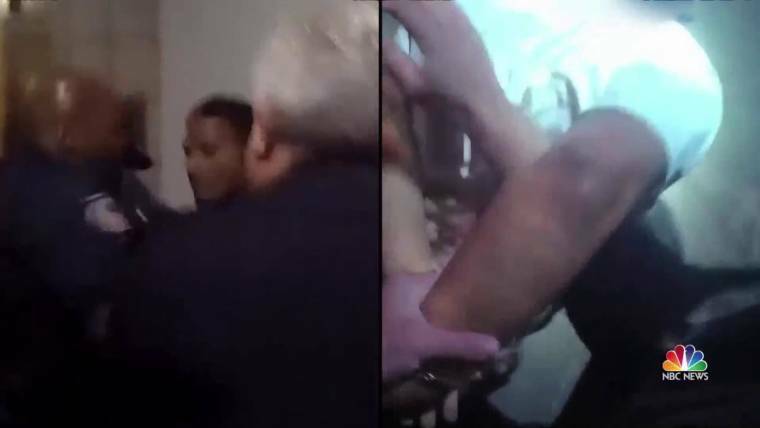 In the video, at least two officers are shown punching Johnson several times in the head; one officer pummels him on the left side of his face five times in rapid succession, before landing a final right hook that causes Johnson to slump down to the ground. While this is happening, the elevator door opens and two more officers emerge and surround Johnson. Mesa Police Chief Ramon Batista told several local news outlets Tuesday night that he first became aware of the video after a civilian reported it to him about a week after the incident, and that four of the officers involved were placed on leave immediately pending an investigation. He did not identify the officers placed on leave or specify whether the others in the video were also under investigation. The officers had been responding to a call about a woman in distress and found Johnson and 20-year-old Erick Reyes, Batista told the Arizona Republic. While police were questioning Reyes, they asked Johnson to stay behind; the incident escalated after Johnson didn’t sit down when he was told, he added. Johnson was arrested on suspicion of disorderly conduct and hindering, and Reyes was arrested on suspicion of disorderly conduct and possessing drug paraphernalia, the Republic reported. The video released Tuesday was recorded by a surveillance camera in the apartment complex and does not contain audio. Mesa police have not released any body-camera video that might also have been recorded. Advocates for Johnson blasted the officers’ actions, as well as what they called “the culture of violence at the Mesa Police Department,” in a statement released Tuesday night by pastor Andre Miller and attorneys Benjamin Taylor and Joel Robbins. They said Johnson had been cooperative and following police instructions when officers began assaulting him — and that the incident would have gone unnoticed if surveillance cameras had not recorded video. Mesa City Council member Jeremy Whittaker said the video was “appalling” at first glance. The Mesa Police Department was thrust into the national spotlight recently after a high-profile incident involving questionable use of force. In December, former Mesa police officer Philip Brailsford was acquitted of second-degree murder charges in the January 2016 shooting of Daniel Shaver. After the ruling, a judge released graphic video from Brailsford’s body camera that showed Shaver sobbing, crawling on his hands and knees and begging for his life in the moments before Brailsford shot him multiple times. In February, the department was also criticized after body-camera footage showed Mesa police violently taking down an 84-year-old grandmother, causing bruises and a black eye. On Tuesday, Batista said he had instituted new policy that would prohibit officers from striking a person’s face or head unless that person is fighting them. The jurors who acquitted Philip Brailsford of second-degree murder last week were told to judge him based on “how a reasonable officer would act, versus a regular person with no police training,” as The Arizona Republic put it. That distinction was crucial, because a “regular person” would never get away with shooting an unarmed man who was crawling on the floor, sobbing and begging for his life. Like other recent cases in which jurors failed to hold police officers accountable for the unnecessary use of deadly force, Brailsford’s acquittal shows that cops benefit from a double standard. Unlike ordinary citizens, they can kill with impunity as long as they say they were afraid, whether or not their fear was justified. Daniel Shaver got drunk and did something stupid. But he did not deserve or need to die for it. On Jan. 18, 2016, Shaver, who was 26 and lived in Granbury, Texas, was staying at a La Quinta Inn in Mesa, a Phoenix suburb, while working on a job for his father-in-law’s pest-control company. After inviting two other hotel guests to his room for a drink, he showed them an air rifle he used for work, at one point sticking it out a window to demonstrate the scope’s range. Alarmed by the rifle’s silhouette, a couple who had been using the hotel’s hot tub informed the staff. That’s how Brailsford and five other Mesa officers ended up confronting Shaver in a fifth-floor hallway. The body-cam video of the encounter, which was not publicly released until after the verdict, shows that Shaver, who according to the autopsy had a blood alcohol concentration more than three times the legal threshold for driving under the influence, was confused by the strange and contradictory orders that Sgt. Charles Langley barked at him. Instead of simply handcuffing Shaver as he lay face down with his hands behind his head, under the guns of three officers, Langley inexplicably told the terrified and intoxicated man to crawl toward him. While crawling, eyes on the floor, Shaver paused and reached toward his waistband, apparently to pull up the athletic shorts that had slipped down as he moved. That is when Brailsford fired five rounds from his AR-15 rifle. “He could have easily and quickly drawn a weapon down on us and fired without aiming,” Brailsford said later. Yet neither of the other two officers who had guns drawn on Shaver perceived the threat that Brailsford did. One of those officers testified that he would not fire based purely on the “draw stroke” Brailsford thought he saw. He would also consider the context, such as whether a suspect is belligerent and threatening or, like Shaver, compliant, apologetic and tearful. Brailsford said he was trained to ignore context. The jury apparently accepted the counterintuitive argument that police, because of their special training, are apt to be less careful with guns than the average citizen would be. A similar dispensation seemed to be at work last June, when Minnesota jurors acquitted former St. Anthony police officer Jeronimo Yanez of manslaughter after he panicked during a traffic stop and shot a driver who was reaching for his license. Even more astonishing was the failure of South Carolina jurors to reach a verdict in the trial of former North Charleston police officer Michael Slager, who shot an unarmed motorist in the back as he ran away. Last May, five months after that mistrial, Slager signed a federal plea agreement in which he admitted the shooting was not justified. All three of these officers said they were afraid, but that is not enough to justify the use of deadly force. When juries fail to ask whether police have good reason to fear the people they kill, regular people have good reason to fear police. SYCAMORE – Police Chief Glenn Theriault has been on administrative leave since April 10 as the city investigates why an Elgin police officer arrested on suspicion of driving under the influence was released without charges. Records obtained by the Daily Chronicle through the Freedom of Information Act show a Sycamore officer was building a driving under the influence case against Elgin Police Sgt. Mark Whaley after an early morning traffic stop Saturday, April 8. Whaley, who has been a police officer for almost 23 years, was handcuffed and driven to the police station, where he was processed. Theriault, who worked with Whaley on the Elgin police force, also went to the police station that night. Whaley later was released without even a traffic ticket because of lack of evidence, according to the police report. The report shows Whaley, 46, declined field sobriety tests and declined to provide a breath sample at the Sycamore police station. It does not say whether Whaley was issued a DUI ticket or read the “warning to motorist” that could have triggered a suspension of his license for a year for refusing chemical testing under Illinois law. Cellphone records show Theriault had three early morning phone conversations with an Elgin police commander and later helped to ensure that a $500 administrative towing fee was waived for Whaley, bypassing a hearing process prescribed by city code. City officials and Theriault have not commented, although in an email to his boss, the city manager, Theriault said he is confident “the outcome will be exonerated” in the case. Elgin Police Chief Jeff Swoboda said his department had no role in the decision to release Whaley early that morning. Whaley told Kampmeier he had recently dropped off his wife and child downtown, then changed his story to say he was in the area for training and had one beer in Sycamore before driving, according to Kampmeier’s report. A story by the Daily Herald about Whaley saving a boy’s life with CPR in 2011 said he lived near DeKalb at the time. After Whaley refused field sobriety tests, Kampmeier arrested him on suspicion of DUI, records show. A second officer, Blake Powers, a 2016 police academy graduate, searched Whaley’s vehicle and found an unopened bottle of Miller Lite near the passenger seat, according to police reports. Powers stayed on the scene as Whaley’s truck was towed, records show. Swoboda confirmed the truck is an Elgin police vehicle. No sergeant was on duty in Sycamore early that morning. Kampmeier contacted the officer in charge, who notified Cmdr. Mike Anderson, who contacted Theriault, phone records show. In a text message exchange that apparently was with Anderson, Theriault asked the commander to go to the station. Anderson said he would update the chief if something went wrong. “I’ll go in as well, just don’t want them feeling unduly pressured by the former EPD guy/chief,” Theriault told him by text. Theriault worked for Elgin police for 20 years, rising to the rank of commander, before joining the Sycamore force as chief in January 2015. Swoboda said Whaley has been on the Elgin force about 15 years, and that he and Theriault would have worked closely together during the time they were both in Elgin. He did not know if Theriault had ever been Whaley’s direct supervisor. Anderson and Theriault had a four-minute phone call at 2:19 a.m., according to phone records. At 3:24 a.m., Theriault called Elgin Police Cmdr. Colin Fleury, who supervises investigations. They talked for 10 minutes, then had two minute-long conversations not long after. The report shows the investigation changed course after Kampmeier brought Whaley to the police station and processed him. “Whaley refused to provide a breath sample,” Kampmeier wrote in the report. “ … Based on my observations and lack of evidence, I released Whaley without charges. City of Elgin administrators were notified regarding the incident. In a memo from Deputy Chief Jim Winters on April 12, police were asked to preserve any dashcam video of the incident, as well as video from inside the police station and other records. Sycamore officials did not release any video to the Daily Chronicle, citing their internal investigation. Around noon April 8, Theriault received a text message, again apparently from Anderson, telling him Whaley had come to the police station to pay the administrative towing fee for his vehicle. The towing company was called and made sure they knew to waive the fee, according to a follow-up message. Sycamore police routinely have people’s vehicles towed and held based merely on the standard of “probable cause” to believe they were used in a crime including DUI. Vehicles are not released unless the $500 fee is paid, plus towing costs. The code does not address situations in which a vehicle is towed and a person is later released without charges. Text messages show an Elgin police lieutenant was to go to the Sycamore station April 11 to pick up the police reports about the incident. Elgin police could not immediately be reached for comment on whether they are doing their own investigation into the incident or what role the department had in the events of that night. Word about the decision to release Whaley spread through the Sycamore police ranks quickly. City officials denied a request for any records showing complaints by members of the public, Sycamore police officers or their union about Theriault, citing their ongoing internal investigation. But it is clear City Manager Brian Gregory soon became involved. Early on Tuesday, April 11, Theriault sent a message to Gregory. Gregory’s response came later that day: a letter notifying Theriault he had been placed on paid administrative leave. Theriault has been temporarily stripped of police powers and was required to turn in department-issued equipment; he is barred from city property or having contact with any city employees, according to the notice from Gregory. Gregory has declined to comment on the matter because it is a personnel issue. The city has hired Lansing-based REM Management Services to investigate the incident, records show. The management consulting firm includes two veteran law enforcement officers who are former police chiefs. After the first story about Theriault’s leave was published in the Daily Chronicle, Anderson sent a note to several officers. Theriault’s future with the department is yet to be determined. City officials have said the investigation is ongoing; a city council meeting scheduled for Monday does include a closed session on personnel matters, but the city has not said if Theriault will be a topic of discussion.